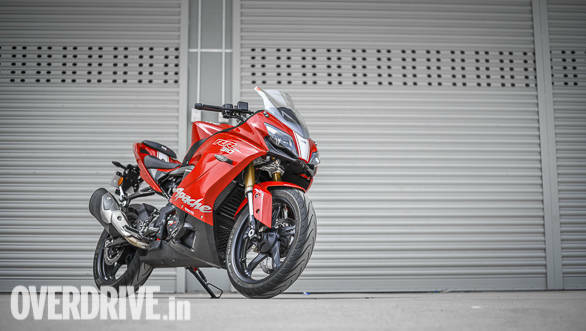 Nearly two years after they first showcased it as the Akula, TVS Motor has finally launched the Apache RR 310. 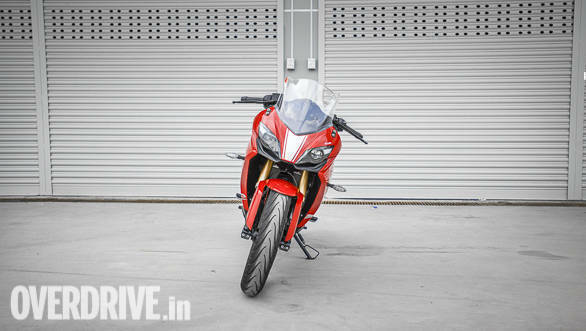 It is the first motorcycle as part of TVS Motor's partnership with BMW Motorrad, co-developed alongside the BMW G310R. 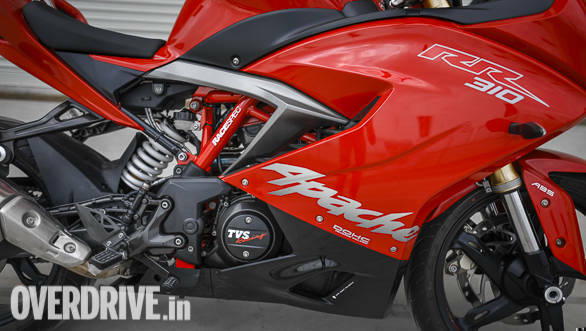 The Apache RR310 is also TVS Motor's first ever fully-faired sportsbike. What's it like to ride is the obvious question on everybody's minds, no? 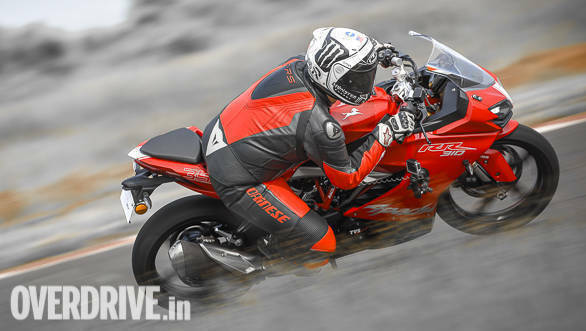 We spent a day riding the Apache RR 310 at the Madras Motor Race Track to tell you all we can. Race bike for the streets? The Apache RR 310 is very special in more ways than one. TVS Motor says the Apache RR 310 isn't just a grand culmination of its hard work over the past two years, but is also its best motorcycle yet, benefitting from the brand's 35 years of experience in racing. The Apache RTR series of motorcycles has grown to become India's second largest sportsbike brand and the Apache RR 310 is expected to take the legacy forward, while spawning a new family of fully-faired sportsbikes. The bike wears an edgy, sharp design, which echoes TVS Motor's claim that the Apache RR 310 has been wind tunnel tested extensively. Our test bikes were wearing a bright red colour with a glossy finish which accentuated the sporty feel, even reminding us of Ducati's sportsbikes. The twin LED projector headlamps with LED DRLs, tall windscreen and racing stripe are all in line with the styling seen on higher displacement sportsbikes. The Apache RR 310 gets 41mm upside down forks finished in gold which adds to the racy appearance. Viewed from the sides the Apache RR 310 is a large motorcycle. The fairing sides use a busy design, and Akula literally means shark in Russian which also explains the inspiration for the fin-like design of the vents. The vents on the sides are designed to channel the hot air coming from the engine and radiator away from the rider. The shark-fin design continues towards the rear and the rear end isn't too wide, but the seats for the rider and pillion both are accommodating. I also like the design of the tail lights  the lights are on all the time but when you brake an additional strip of LEDs glows underneath adding to the appearance. The design of the instrument console is unique  the all-digital console uses a vertical layout as opposed to the conventional horizontal one. When the display is off, it looks slightly odd but the vertical layout makes sense as soon as you turn the ignition on, as all the information  there's tons of it  is offered in a manner that will not need you to look around. The riding position isn't super committed as you would expect though. The clip-on handlebars are placed high for a comfortable riding position. To give you a perspective, the Apache RR 310's seating position is far more comfortable than its arch rival, the KTM RC 390. One of the biggest highlights of the Apache RR 310 to me are its quality and fit-finish levels. Being TVS Motor's flagship product the Apache RR 310 boasts very high quality levels and paint finish, quality of plastics and fitment of panels are all top notch. 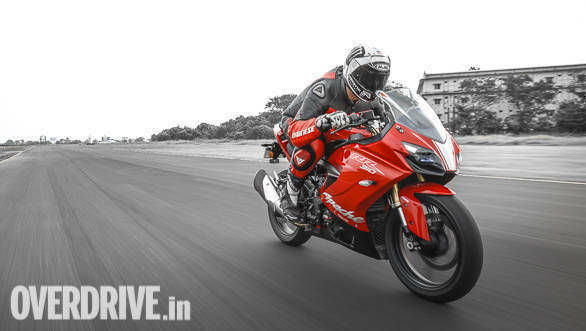 TVS Motor claims the Apache RR 310 betters the quality levels offered by several European manufacturers on their entry-level sportsbikes and we cannot disagree. The Apache RR 310 uses the same liquid-cooled, 313cc single-cylinder engine as the BMW G310R. Outputs are identical too, at 34PS and 27.5Nm though one major difference is that TVS Motor is using its own custom ECU. TVS claims the tuning of the engine is different from the BMW and it has been tuned for a better response in terms of acceleration and fuelling. The six-speed gearbox uses the same ratios, but the final drive is different as the rear sprocket uses 41 teeth opposed to 40 on the BMW. The biggest highlight here is the fact that the engine uses a reverse inclined architecture, a first for our country. What this means is that the cylinder is inclined towards the rear of the motorcycle and has its intake towards the front and the exhaust towards the rear, as opposed to the other way round . Apart from helping extend the length of the swingarm without making the motorcycle longer, this also makes for better mass centralisation, thereby benefitting handling. The engine uses an integral crankshaft with a one-piece construction and a split connecting rod that makes it more compact and helps in reducing internal losses. It uses a closed loop fuel injection system from Bosch and fuelling is precise and consistent. TVS Motor is claiming a 0-60kmph time of 2.93 seconds and a top speed of 160kmph. 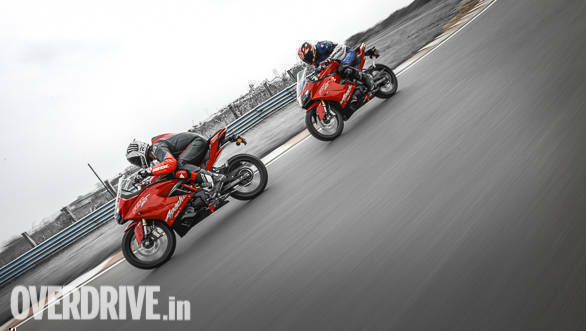 The exhaust note is typical of single cylinder engines and thanks to the precise fuelling, throttle response is crisp. The clutch lever has a light feel and the gearbox works well  gears slot in perfectly and shifts are precise and consistent. The engine makes for brisk acceleration  every time I took off from standstill the surge of power was consistent and only tapered off towards the top of the rev range. The smooth throttle response and fuelling also make it easy to modulate the throttle mid corner. The engine thus has a likeable feel overall. Power delivery is linear, which makes it easy to ride the bike hard and I was hitting 140kmph on the speedometer consistently on the back straights. The gearbox compliments the engine well and there's a refined, premium feel to the powertrain overall. That said, I would have liked some more performance. Current performance levels are accessible and easy to get used to, and experienced riders might just be left wanting for some more. The engine is high on refinement but a bit of vibration was creeping in from the seat at high revs, though that to me is an easy fix and revising the engine mounts should resolve the issue. 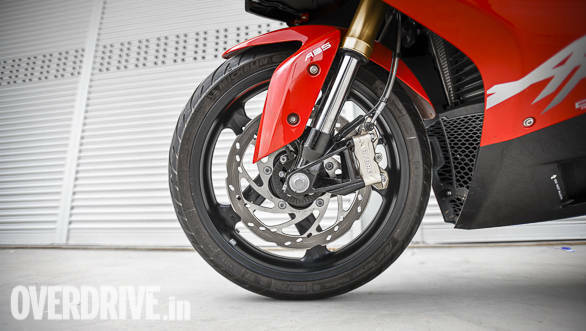 The Apache RR 310 uses a trellis frame along with an aluminium die-cast swingarm, while the rear subframe is a bolt-on unit. TVS Motor and KYB have worked closely to develop the bike's 41mm upside down forks and monoshock. TVS Motor claims the suspension has been setup offer a perfect balance between a good ride and sporty handling. While it was difficult to assess the former, on track we were able to get a good sense of the Apache RR 310's handling. The several national champions TVS Racing has produced over the years have worked closely in Apache RR 310's development, helping perfect its handling. The suspension and chassis made it easy to ride the bike hard on track, despite the MMRT being a bumpy circuit. The Apache RR 310 is also very forgiving in the sense that even if I entered a corner too hot, as I was able to stay in control and make it through. It is also very good in terms of flickability and throwing the bike from one side to the other around the chicanes was never an issue. Leaned over fully the bike feels planted, and the suspension even soaked up the undulations on track well. Clearly, a lot of hard work has gone into perfecting the setup, and the Apache RR 310 is satiating to ride on track. Credit also goes to the Michelin Pilot Street tyres. The Apache RR 310 uses a 110/70 tyre at the front and a 150/60 tyre at the rear that made it easy for me to explore the bike's potential, to the point that I could lean hard enough to ground the footpegs! That said, the pegs could have been placed higher to improve cornering clearance. The Apache RR 310 comes equipped with petal discs at both ends  a single 300mm disc at the front with a radial caliper and a 240mm disc at the rear. The front brake offers good bite but there were a few instances when I was left wanting for more feel, especially when braking hard from speeds at corner entry. On the whole, the Apache RR 310 is thus a well accomplished entry-level sportsbike in terms of its handling and clearly benefits immensely from TVS Motor's 35 years of experience in road racing. The TVS Apache RTR series has become an apt portrayal of TVS Motor's intent to build sporty, engaging motorcycles and with the Apache RR 310 it hopes to take things to the next level. Lots of hard work has gone into the bike's development, and it will be sold in as many as 70 different countries across geographies in phases. 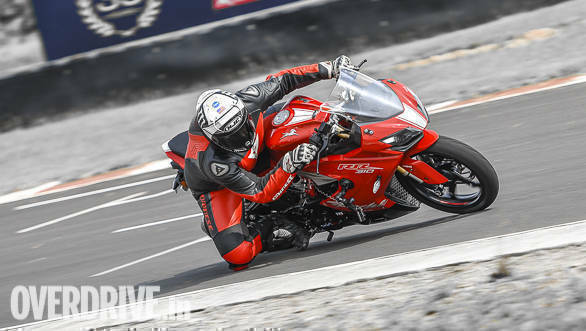 It is easily the most special motorcycle from TVS Motor yet, and as an entry-level sportsbike the Apache RR 310 is indeed a well put together package, at least on the racetrack. It however remains to be seen how the bike will feel to ride everyday on our roads. 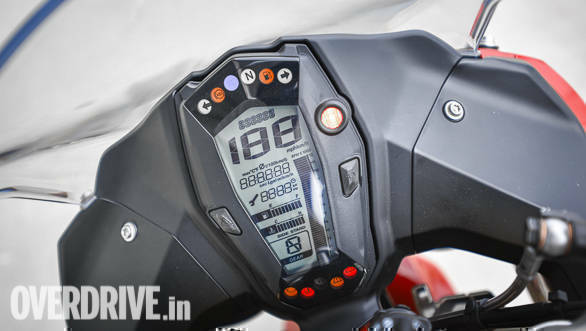 In the Indian context, the TVS Apache RR 310 will compete with the KTM RC 390, as also twin-cylinder engined sportsbikes like the Kawasaki Ninja 300 and the Yamaha YZF-R3. Priced at Rs 2.05 lakh ex-showroom, the Apache RR 310 also undercuts its arch rival, the RC 390 well. 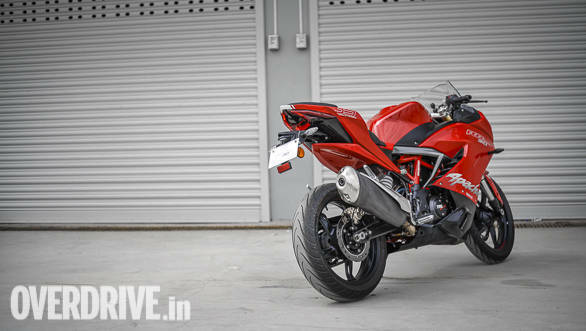 To sum it up, the Apache RR 310 is thus a bike that's friendly, forgiving and easy to ride. And with its high refinement, fit-finish and quality levels and the good pricing, TVS Motor clearly has a winner on its hands here.